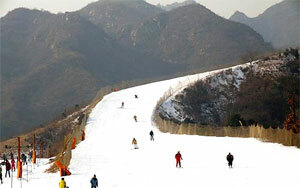 Trip highlights: Do you want to experience a ski holiday with your family or friends in China, to enjoy white snow view? We've got it all covered for you in advance. A unique leisure and recreation experience will be taken in Nanshan Ski Resort winter days. We will leave for Nanshan Ski Resort, 62 KM away from Beijing. Please package your luggage, you would spend two nights at the hotel in Nanshan Ski Resort. Our tour guide would assist you in checking in and guide for your skiing there. Then the guide see you off. The rest of the day is skiing on your own. [ Optional ] Beijing: As the center of politics, cultural and international exchange, Beijing is a modern metropolis full of vitality. For the history buffs, Beijing is a living museum, but it has something to offer everyone. It is also the starting point for most of our China vacations. Ski in Nanshan Ski Resort on your own (without guide and driver service). Today's all meals also is on your own. Half day ski in the morning. Lunch is on your own. Our tour guide will pick you up in the afternoon and drive back to Beijing. Copyright © 2004-2010 beijingholidays.net™ All rights reserved.